Ultratech 9611 P2 plus spill pallet with drain offers safer and less strenuous drum handling with its low profile that is nearly 50% lower than standard spill pallets. Sump is made of low-density polyethylene with UV inhibitors for long-lasting use. 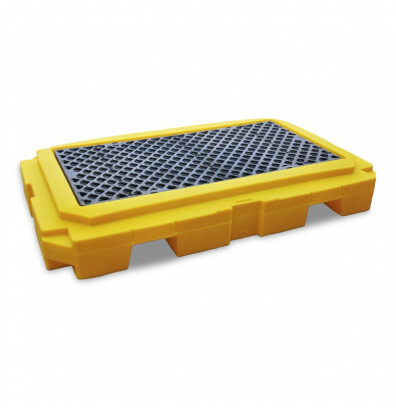 Removable injection-molded polyethylene foam grate features a non-slip surface. Able to hold two 55 gallon steel or poly drums or any other smaller container to contain leaks, drips, and spills. Spill capacity of 66 gallons. Load capacity of 4,500 lbs. 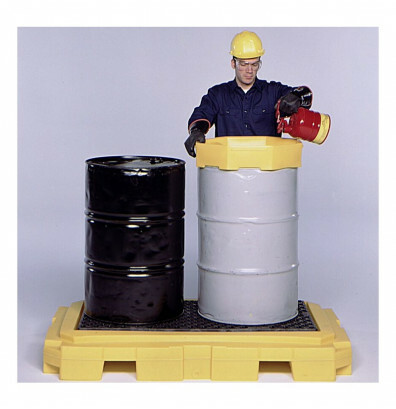 Spill containment for two 55 gallon drums or any other smaller container. Low profile positions drum funnels below eye level to significantly reduce the potential for hazardous fluids to splash into the eyes or face. Includes drain plug for simple emptying.